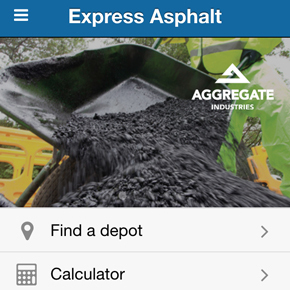 The Express Asphalt app features a asphalt calculator, designed to work out what the required volume of asphalt will be for any project by entering the area size and depth of where asphalt will be laid. The app also utilises location services, allowing users to find their local depot from anywhere in the UK. The Express Asphalt app is part of Aggregate Industries Express Asphalt service which has over 40 plants nationwide – including a customer service team and guaranteed order turnaround of under half an hour for single loads of standard products. The app is available to download now via the App Store for iOS and Play Store for Android.